The Honda Pilot was redesigned for 2016, making it the third-generation of this crossover SUV. It carries over to 2017 unchanged. The Honda Pilot was one of the first big crossovers, and it was a hit. With its rounded edges, the first-generation Pilot tried to look like the Ford Explorer, and it succeeded as a Volvo wagon for people priced out of Volvos. In the second generation it got boxy like SUVs, and that styling didn’t work. Now in its third generation, it’s rounded again. With three rows of seats and seating for eight, it’s Honda’s most versatile vehicle. The ride is compliant and plush, the steering relaxed. It feels luxurious and mature, like its upscale sibling the Acura MDX. Front-wheel drive is standard, all-wheel drive available. On top of that, there’s an optional traction management system for more traction in snow or mud. It can tow up to 5000 pounds. Pilot pulls strongly with its 280-horsepower V6. It uses either a 6-speed or 9-speed automatic transmission. The 2016 redesign cut a lot of weight; it’s now between 4054 and 4317 pounds, depending on equipment, while some rivals hit 5000 pounds. In crash testing, the Pilot earns a Top Safety Pick+ from the IIHS, but it received only an Acceptable rating for headlamps, so be careful at night. It gets five stars overall from the NHTSA, with four stars from frontal crash results. With front-wheel drive and the 6-speed automatic, the 2017 Honda Pilot is EPA-rated at 19 miles per gallon City, 27 Highway, and 22 Combined. One less mpg with all-wheel drive. The 9-speed transmission improves that by about one mile per gallon. In our long-term road-test Pilot, we’re seeing 19 mpg Combined. The 2017 Honda Pilot comes in LX, EX, EX-L, Touring, and Elite models. The 2017 Honda Pilot LX ($29,995) comes standard with cloth upholstery, air conditioning, cruise control, seven-speaker 200-watt sound system with 5.0-inch color touchscreen, USB port, 17-inch wheels, Bluetooth with audio streaming, and CarPlay and Android Auto. As with most models Pilot LX is available with all-wheel drive ($31,795). Pilot EX ($32,430) upgrades with three-zone climate control; a power driver seat; a LaneWatch right-side camera; satellite radio; remote start; two more USB ports; and Pandora audio streaming and texting capability. Pilot EX and EX-L trims get a larger 8.0-inch display and the Android-based Display Audio interface, with its big tiles and icons and generally friendly operation. The Pilot EX-L ($35,905) sports leather; a power tailgate; a power moonroof; heated front seats; and the one-touch second-row seat. 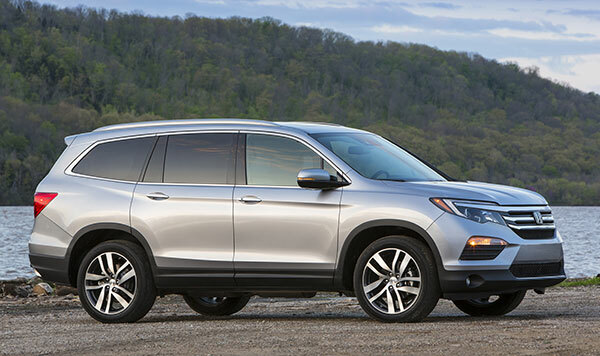 Pilot Touring models adopt Honda Sensing safety system, Blu-ray DVD entertainment; a navigation system; 20-inch wheels; memory seats; parking sensors; two more USB ports, for a total of five; ambient lighting; Stop/Start; and a 115-volt outlet. On the most expensive Pilot Elite, you’ll find LED headlights; a second panoramic roof panel over the rear seats; rear heated seats; front ventilated seats; a heated steering wheel; automatic high beams; HD radio; and second-row captain’s chairs. Second-row seating is a split-folding bench or a pair of captain’s chairs on upper trims; between those buckets is a floor-mounted tray with cupholders. On EX-L and above, a power button folds forward the second-row seats and slides them forward. The floor is low and there’s room to climb back to the third row. At least for kids; it’s a bit tight for adults. The LX, EX and EX-L use a 6-speed automatic transmission, while the Touring and Elite get a new 9-speed automatic, which brings one more mile per gallon. We prefer the 6-speed. It has a narrower spread of gears, making it a bet less quick from the start and a bit less relaxed on the freeway, but it shifts more cleanly. Only once or twice did we feel it wait too long to upshift; while with the 9-speed, it happened fairly often. It also surged when it sought a gear lower than we did. If we had wanted that gear, and had shifted with the paddles, there wouldn’t have been an issue. Torque vectoring on AWD models directs more power to the outside wheel in a turn to help it turn in better in turns. Pilots with 20-inch tires have softer shocks to offset the harshness from the short sidewalls. Front-wheel-drive versions with 18-inch wheels and tires have firmer suspensions. The AWD can send up to 70 percent of available torque rearward, then split that power between the two rear wheels using electronic actuators and hydraulic clutches. It all happens quicker than you can think. Most models come with traction control with several modes (Normal, Snow, Mud, or Sand), enhancing capability in foul weather, but it’s limited and not designed for rugged terrain. The available road-departure mitigation can help inattentive drivers stay in their lane, but we found it annoying.